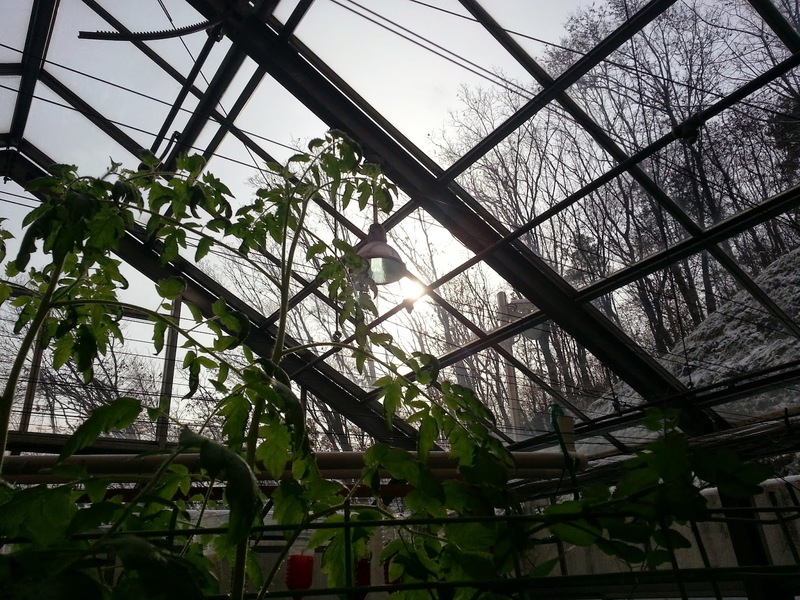 This week is the last week before winter break and the greenhouse will have to be unkept for for about a month. 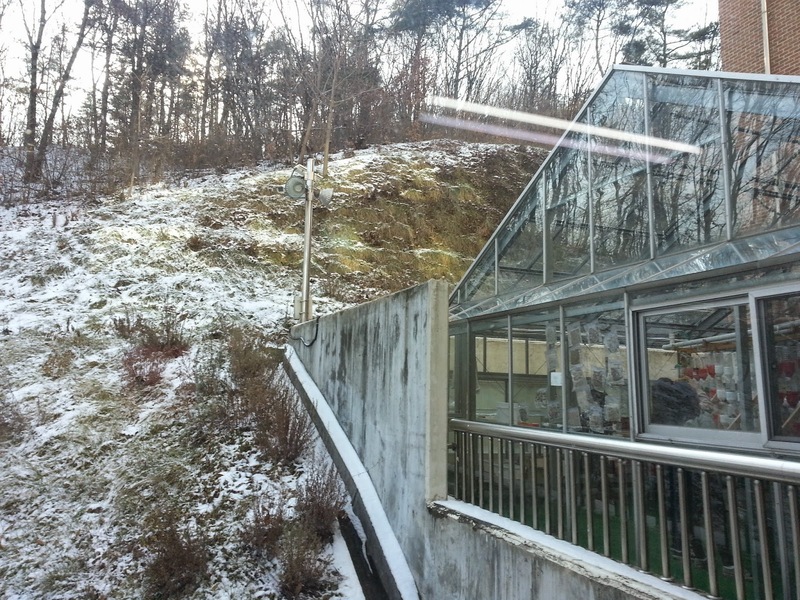 During the winter in Korea, it snows a lot and the temperature can drop suddenly(up to -9°C), so the plants may have a hard time. 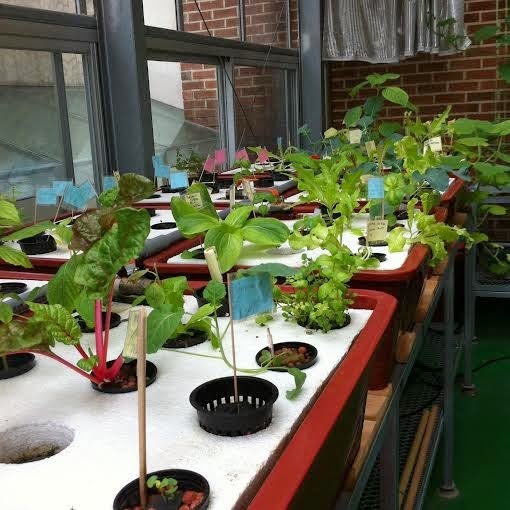 In order to prevent this, we fixed the heater and made new projects with creative ideas in order to make it better and more easier for the plants to grow. All of the plants except for about 4 or 5 are growing well but there are lots of saplings and plants that aren't sturdy yet. 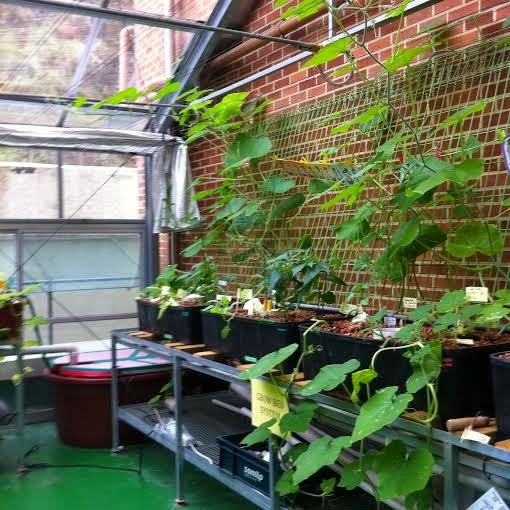 About 1/4 of the plants total in the greenhouse are big and some plants are ready to harvest. 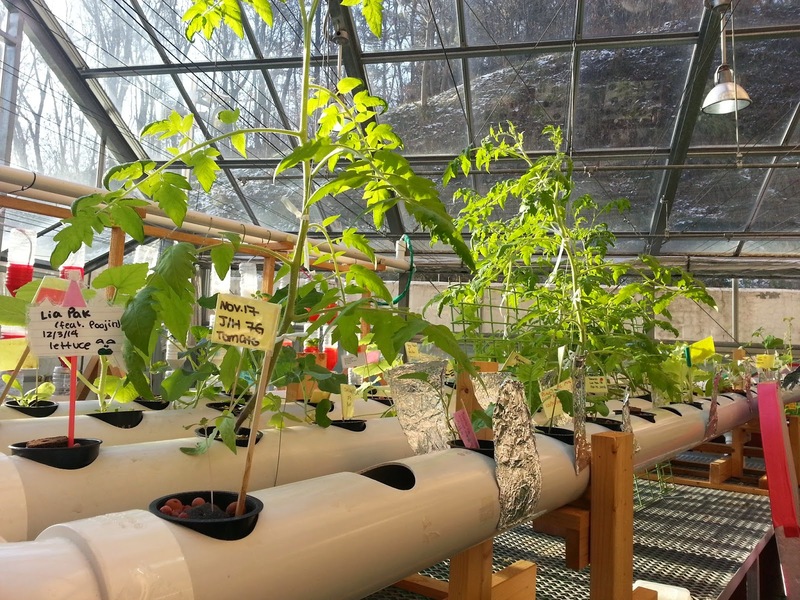 The Grow-bed system and the horizontal system are doing well and it's positive that most of the plants will survive the winter, but plants in the raft system are mostly still small and need gentle and careful care. Also, the vertical system is closed down as explained in my last blog post. The "workers" in the greenhouse think that some plants will survive but most won't and it will be hard for them to. 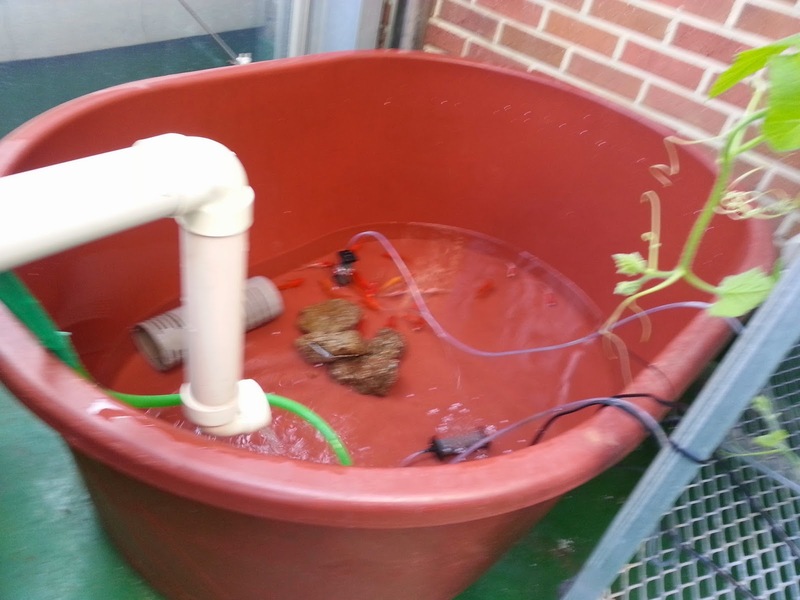 They also say that the fish will probably survive due to the fact that the heater is fixed and that the greenhouse is getting warmer. 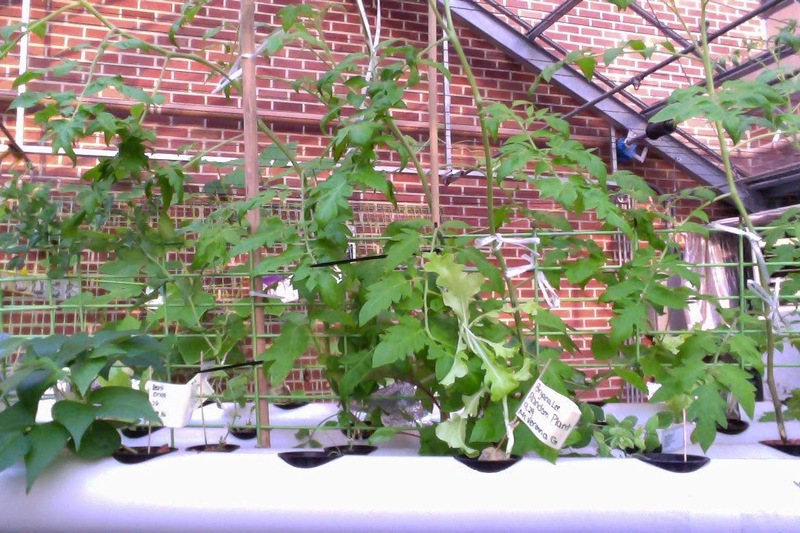 Horizontal System: There were many plants that were about to snap off, especially the tomato plant. They had big leaves which caused the stem to bend over. Luckily, before they snapped, people put poles and tied the plants to the pole so that it would stay upright. This is the example I used for putting the plants helping the plants stay straight (picture #1). Now, people used wooden poles to fix the plants and preventing them from snapping off. No plants are in an unhealthy state, except for the vertical system. Vertical System: The vertical system is in very big danger because it flooded and they had to temporarily shut the power off. This will affect the plant growth and we need to pay closer attention to plants that are growing in the vertical system. Sadly, I don't have a footage of it but many of you should know from your friends, or teachers. If not, then please explain it to other people who doesn't know what happened to the vertical system. 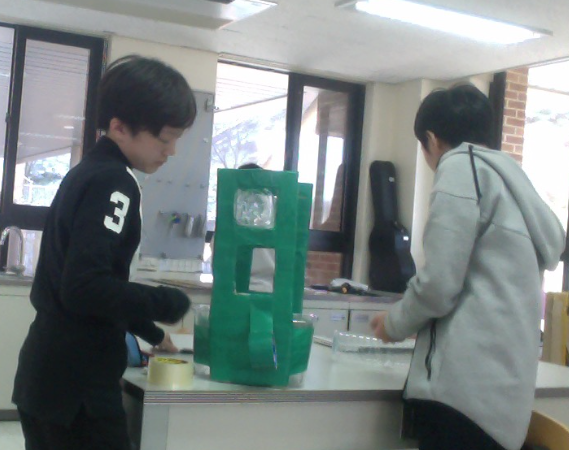 A Finished Product in 7th Grade Science A block: This group, (Ning and Zane from A block), is very close to completing their product which was a fish feeder. 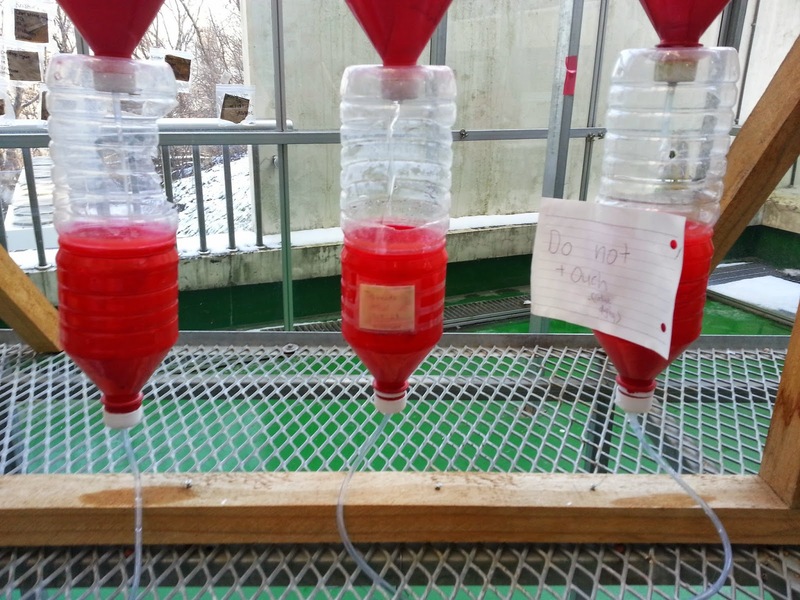 In the picture (picture #2), they are testing if the fish feeder will actually be able to pick up fish food, which are the colorful beads in the photo. 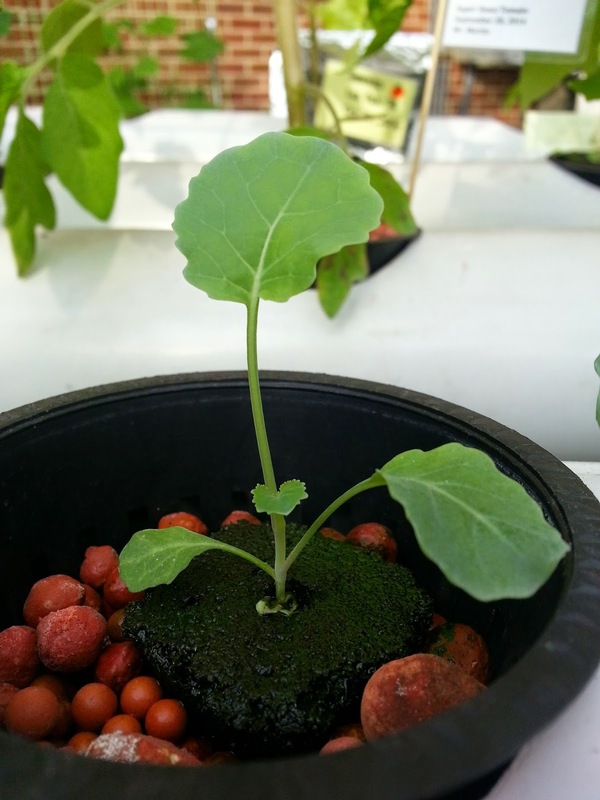 If the product is successful, then it would be put into the greenhouse, and would be ready to operate it's first feeding. 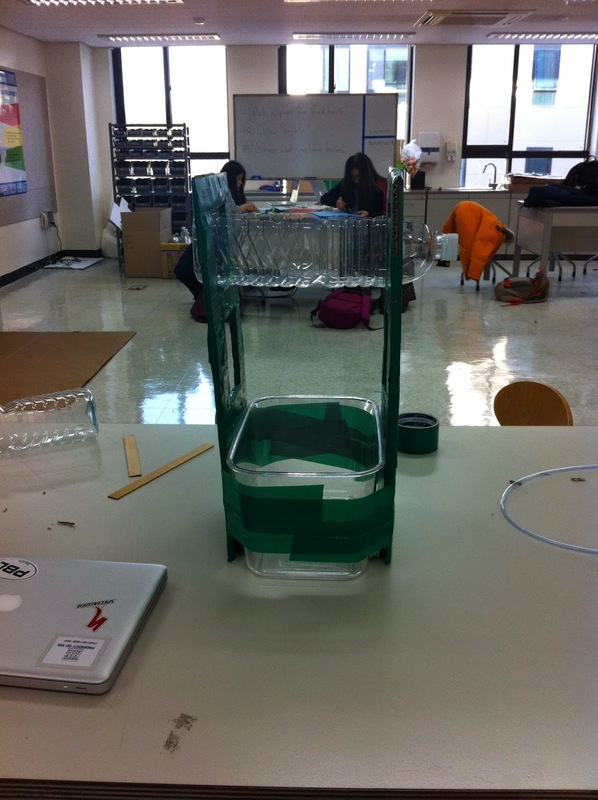 Let's all hope that their product will create a positive revolution to the KIS greenhouse. The vertical system shut down. Some of the plants have withered and aren't doing that well but the majority of the plants are doing well and have continued to grow. Some plants aren't growing due to the fact that there's snow, low temperature, and less sunlight. I think the plants grew very well last year because we started in spring and ended in summer, therefor, they had the right temperature and the right amount of sunshine. This year, we started at autumn and now it's December, so the plants are having a hard time. 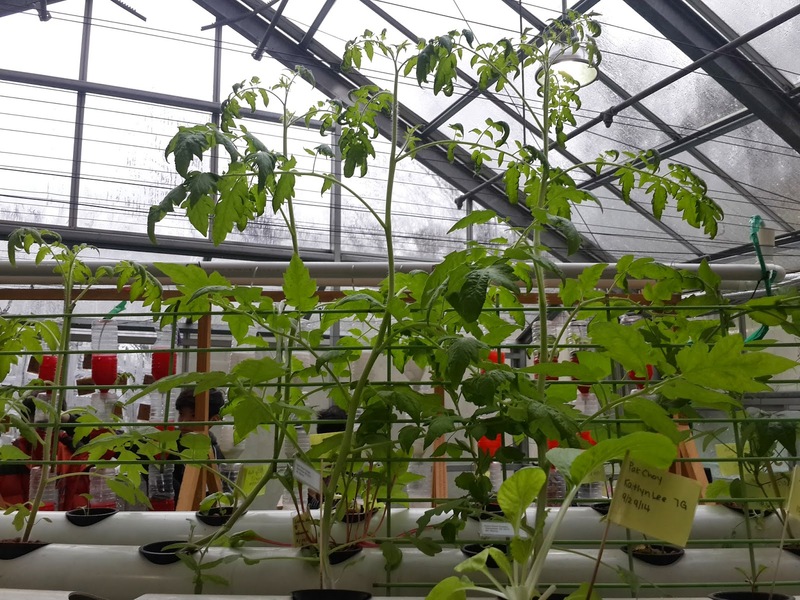 For the projects in the greenhouse, they're working pretty well and some new products are making the sunlight reflect to the plants, experimenting on germinations, and making a new system that will improve and use less space. In the greenhouse, you can see new projects going on and it will hopefully made the greenhouse better. Plants in the horizontal system. A product/project that reflects sunlight to the plants. The pumpkins in the grow-bed system. When I interviewed the people working in the greenhouse, they said some plants weren't doing so well but most were. The vertical system has closed down due to the fact that it was causing too much problems such as the leaks, spills, and there not being too many plants. The plants in the raft system are also not doing so well and many haven't gotten big yet. On the other hand, the horizontal system and the grow-bed system are going well and the plants are starting to show flowers. Some of the raft system plants that aren't doing well. 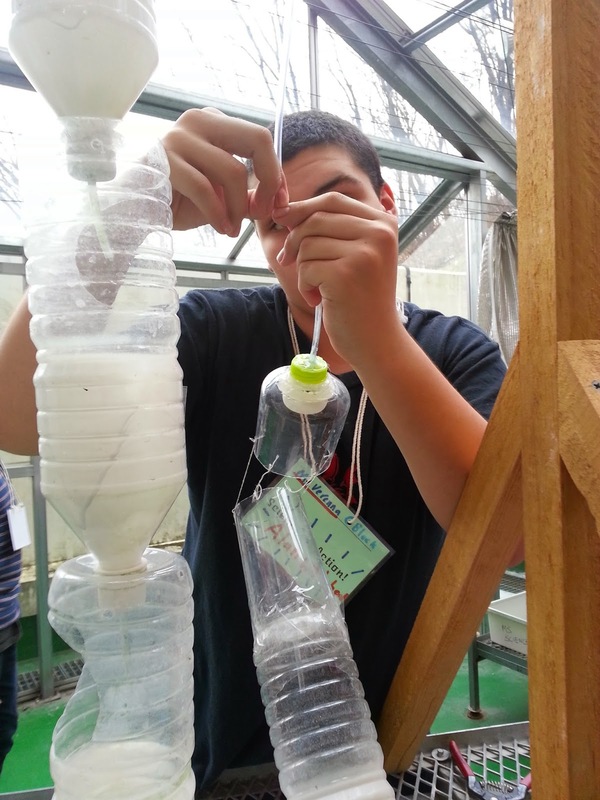 Farmer's Report- Today there was a problem in the vertical system, so we had to fix it, but we didn't have enough tubes. 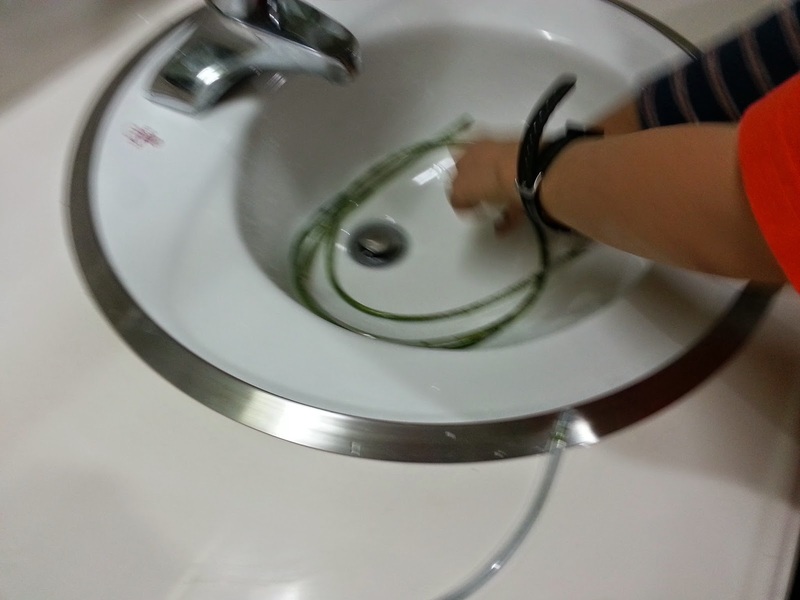 That is why we decided to use the tubes that we already used. 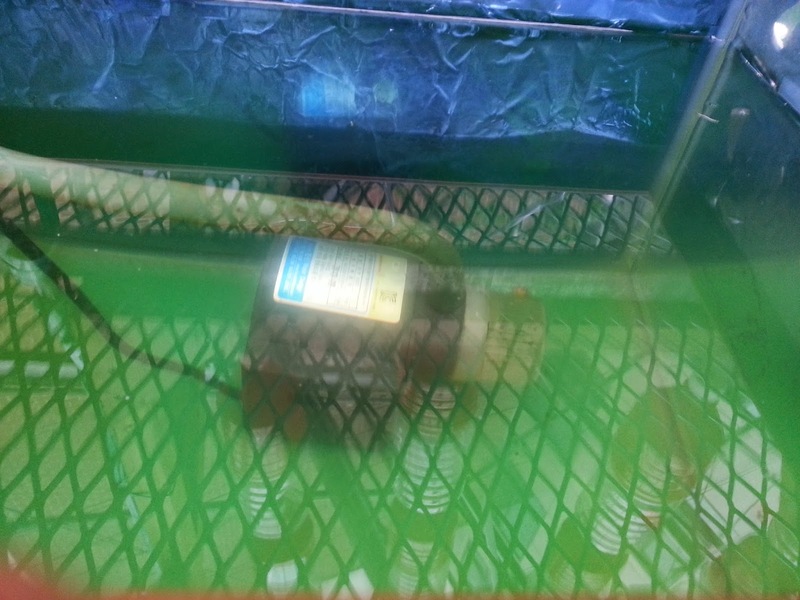 We realized that in those tubes there were too much green algae. Algae are just like other plants. They need water, sunlight and nutrients for it to grow. Algae are growing inside those tubes because they receive water, receive sunlight and receive nutrients that goes through the tube. I will talk more about algae in the Research Biologist's Report. Engineer's Report- There was a problem in the vertical system. The water pump was running too fast making the pipes filled up with water. The pipes were filled up with water and that made the bottles overflow too. Then the 4 rows of the system was destroyed. For now, we stopped the whole system and we are fixing the system and trying to find out what made this happen, so this problem wouldn't happen again. As I mentioned in the Farmer's Report, algae was stuck in the tube. 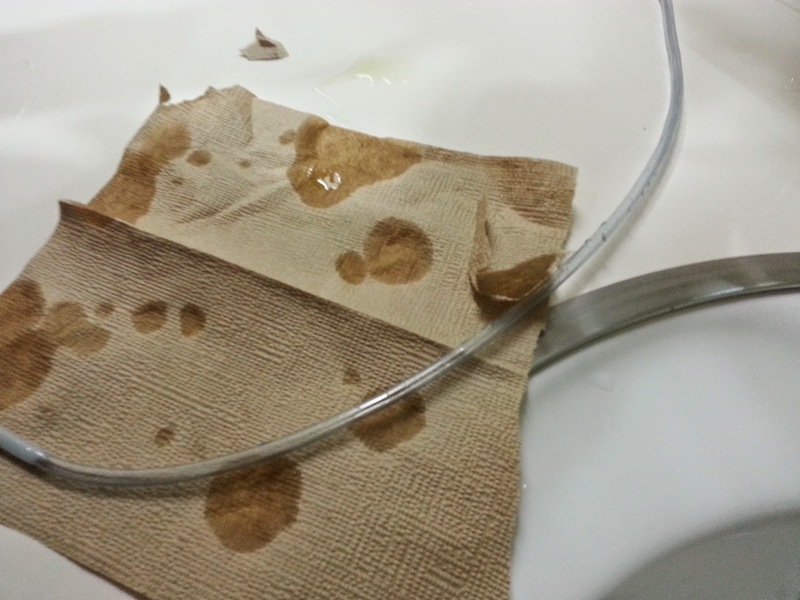 We fixed this problem by putting a small piece of tissue inside the tube and pushing the tissue with a wire. If you push it all the way through, the tube would be perfectly clean. With those tubes, we fixed the vertical system. 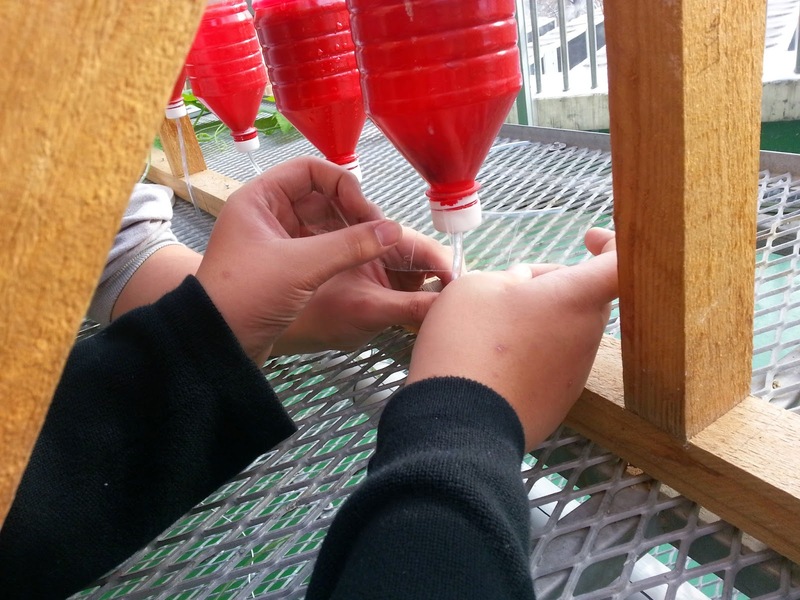 We tried to try out the product that Ismail made for the Vertical System. 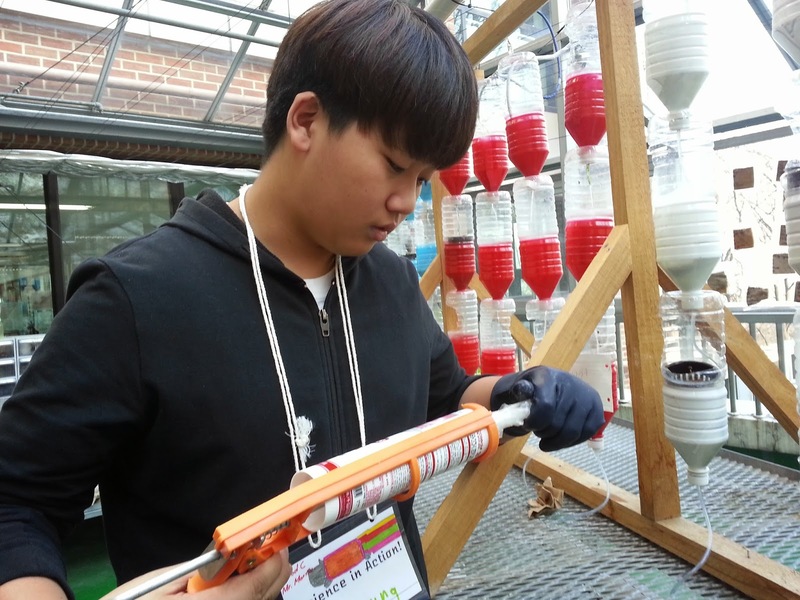 Research Biologist's Report- Algae is a simple nonflowering plant that contains chlorophyll but no true stems, roots, leaves, and vascular tissues. Algae can grow anywhere. 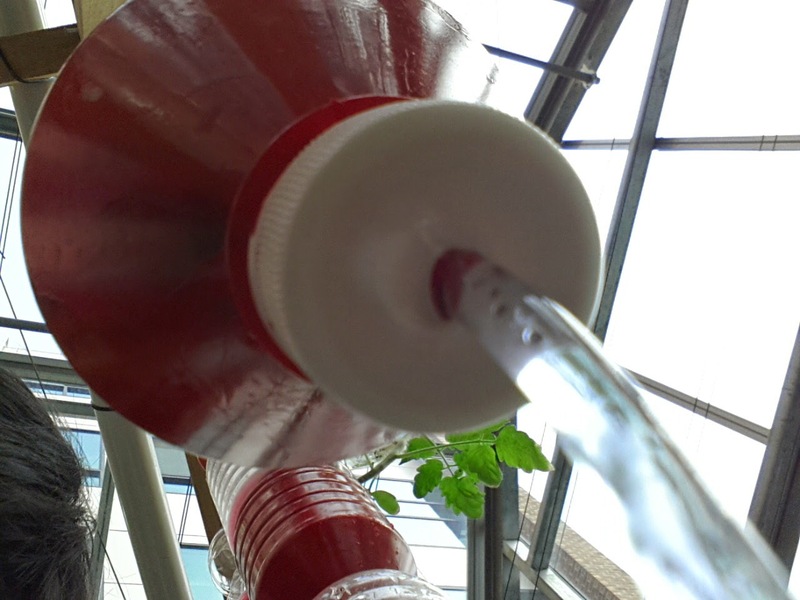 Algae only needs sunlight, water, carbon dioxide and a few inorganic nutrients to grow. 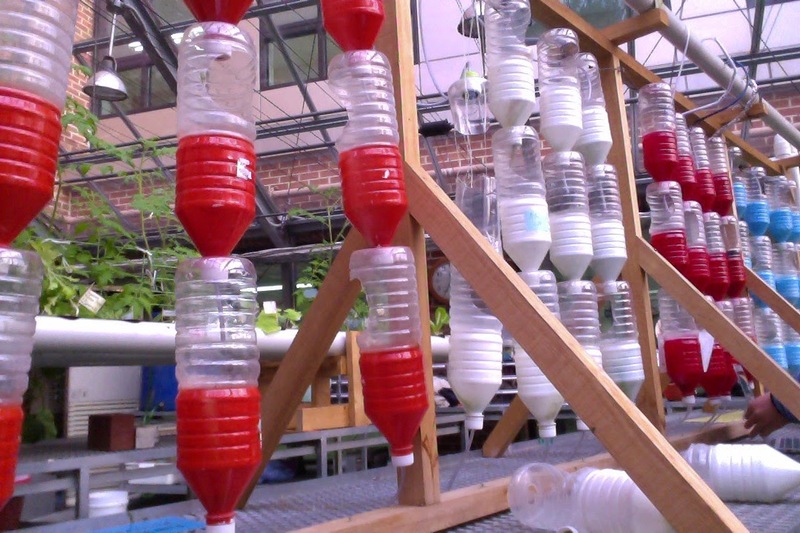 It was possible for algae to grow in the tubes where because it received sunlight in the greenhouse, had water because water flowed through the tubes and in the water we put nutrients. We can stop this from happening by covering the tubes with duck tape or foil to stop sunlight from coming through the tubes. 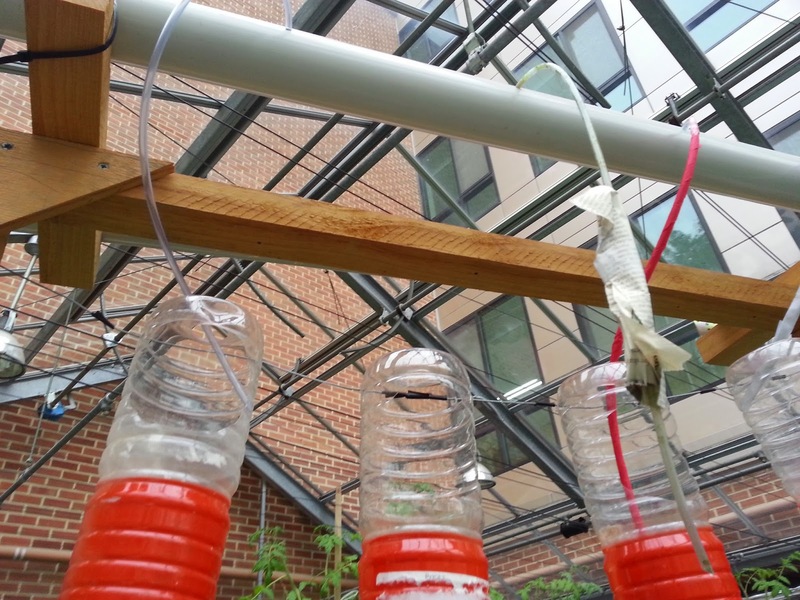 If we do this, algae wouldn't grow in the tubes because they need to sunlight to survive. 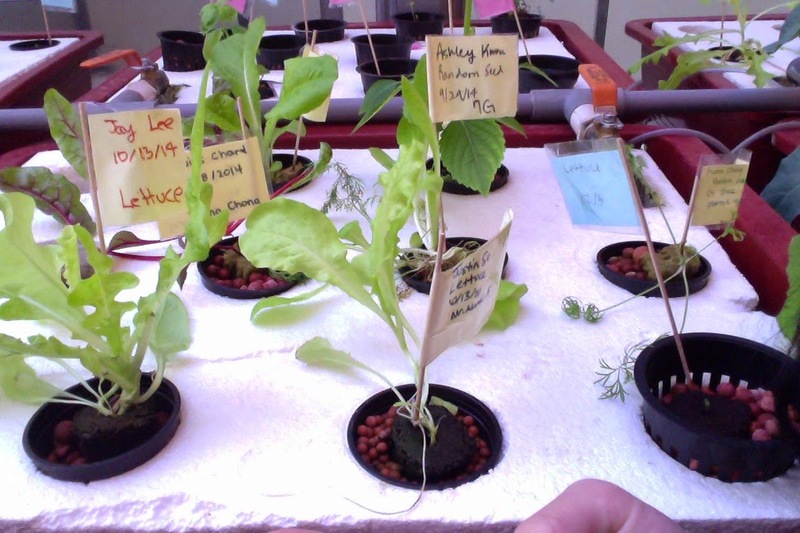 Farmer's Report- We realized that some of the plants were not growing fast enough. We assume that this is happening because the temperature is getting lower and lower. The lower the temperature the slower growing plants. 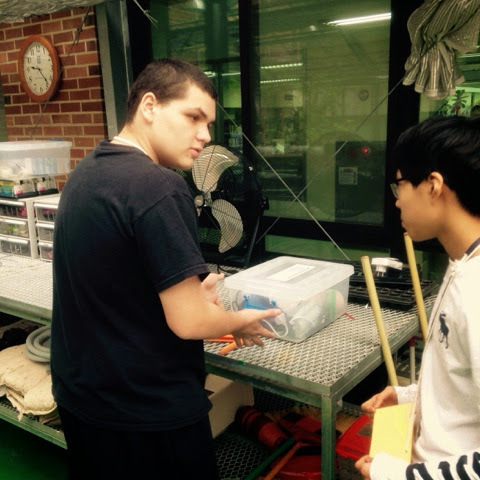 We also found out that there was a problem in the raft system and the water level was so low in the fish tank. There were barely any water left in the tank. Because of this, the fishes were cold. Sadly, one fish died and we felt so sad for it. Engineer's Report- Today there were a lot of problems. There were three leaks in the vertical system and the Engineer had to fix this problem. This time we tried a different method. We tried using the gun that shoots silicon. It was pretty useful, because it covered up the leak totally. Even if we covered up the leak, there was a little tiny leak and we didn't know how to fix. 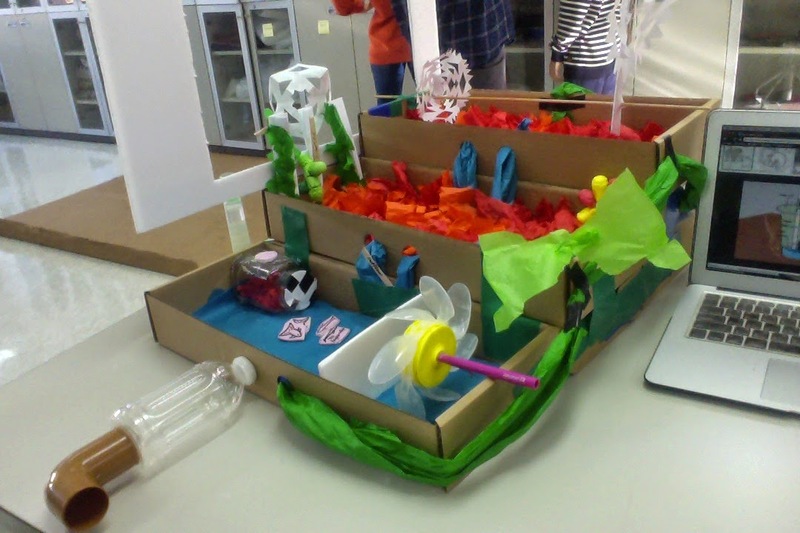 Another problem was that in the raft system, the fish tank barley had any water in it. We actually don't know how it happened and it is a mystery. We fixed this problem just by filling up the tank with water, but it took us a while. We are still figuring out why this incident happened. 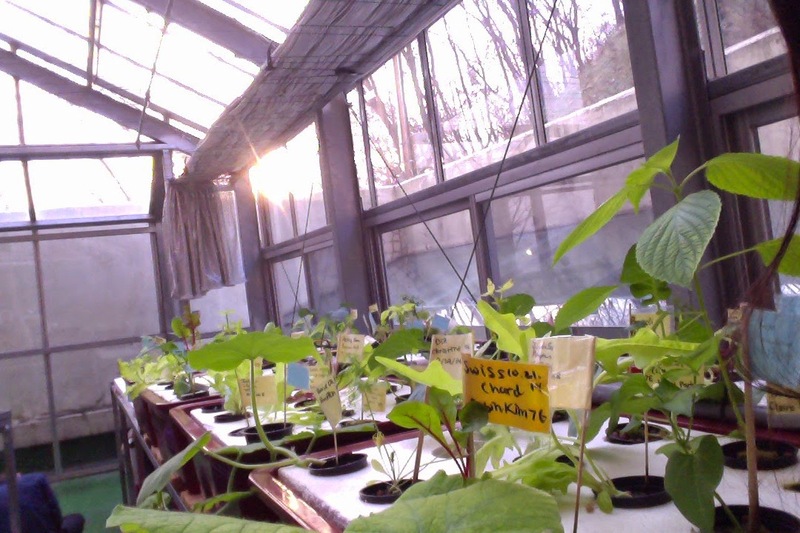 Research Biologist's Report- Today I realized that the plants were not growing so fast because it is getting colder outside. 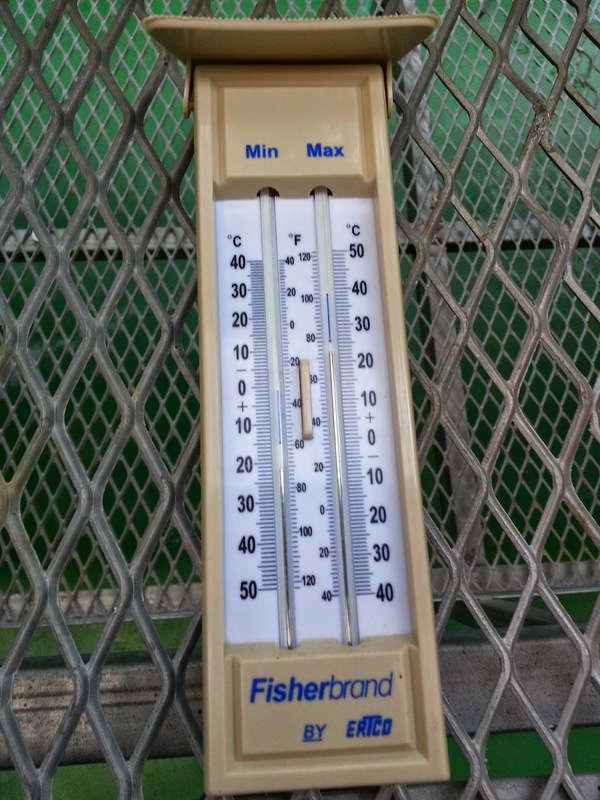 If the temperature goes down, the plants won't grow fast then it is in the summer. One reason is because the days are short in winters which reduces the amount of sunlight the plants get. 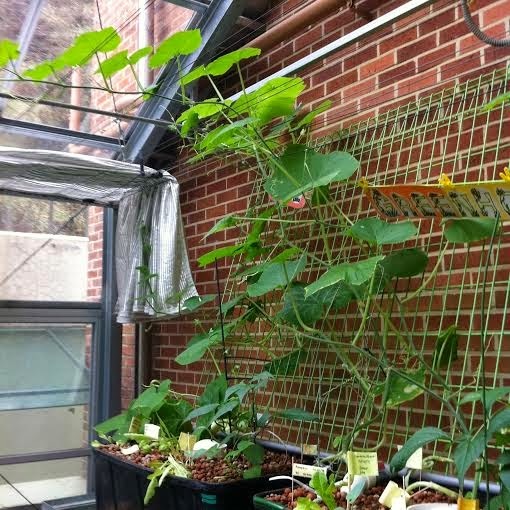 Scientists say that a drop in temperature slows down a plant's metabolism largely because the enzymes that drive these biochemical reactions don't work so well in the cold. This is the reason why plants grow slower in winter than summer. Drew working on his project. Anna working on her heater. 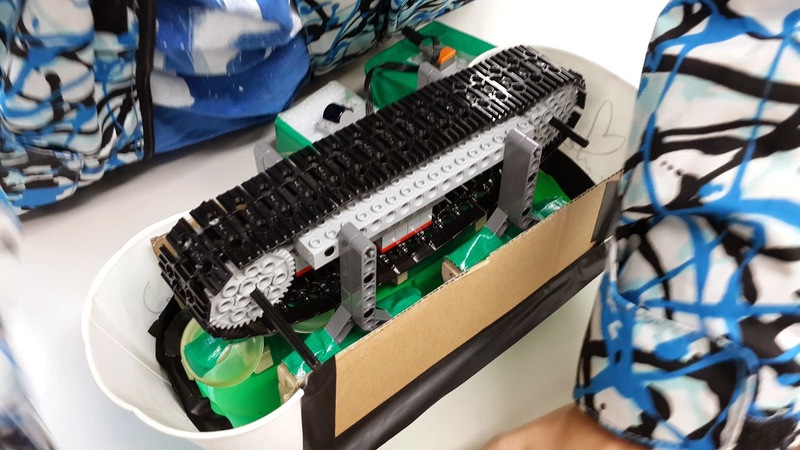 For the past few weeks, we have been working on a project called the iGrow Project. 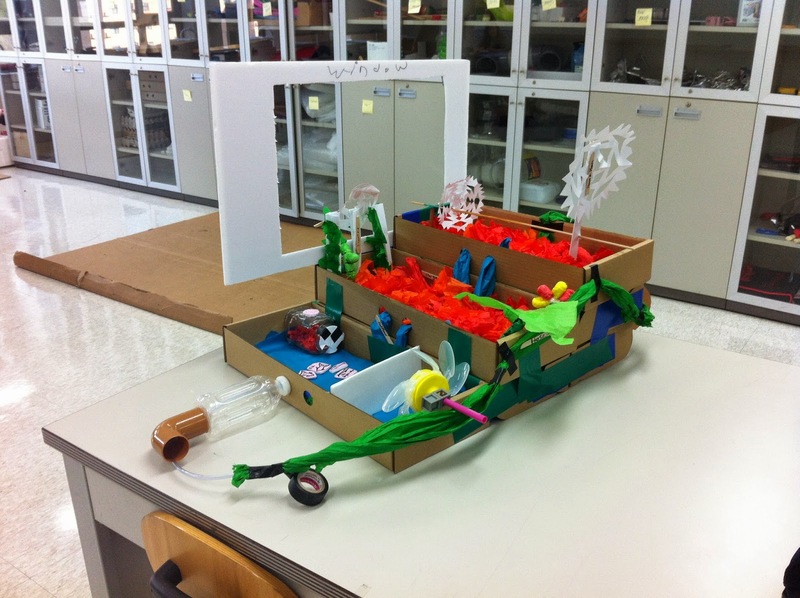 This project's purpose is to use our creativity in order to make either a product or role that will benefit the greenhouse in any way. 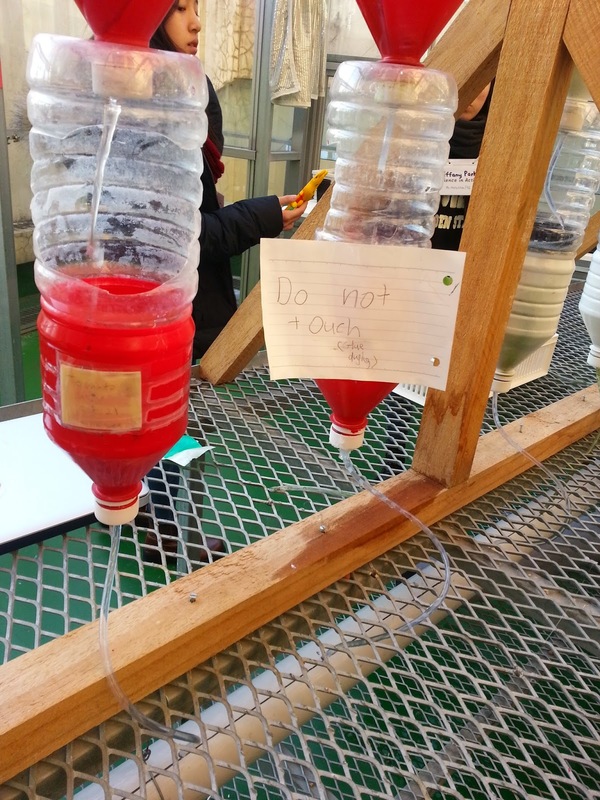 Eugene, Daniel, and Sabine's new system. 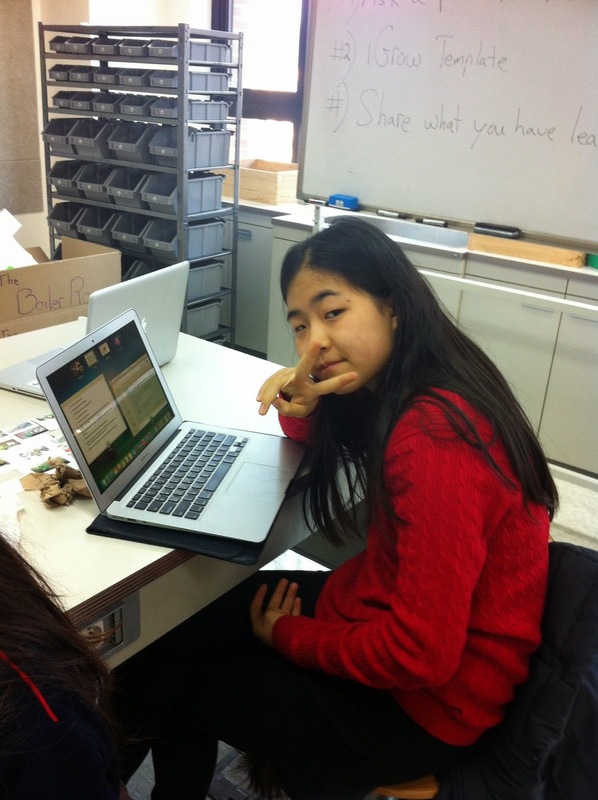 Some people choose a product, which means they made an object for the iGrow Project. 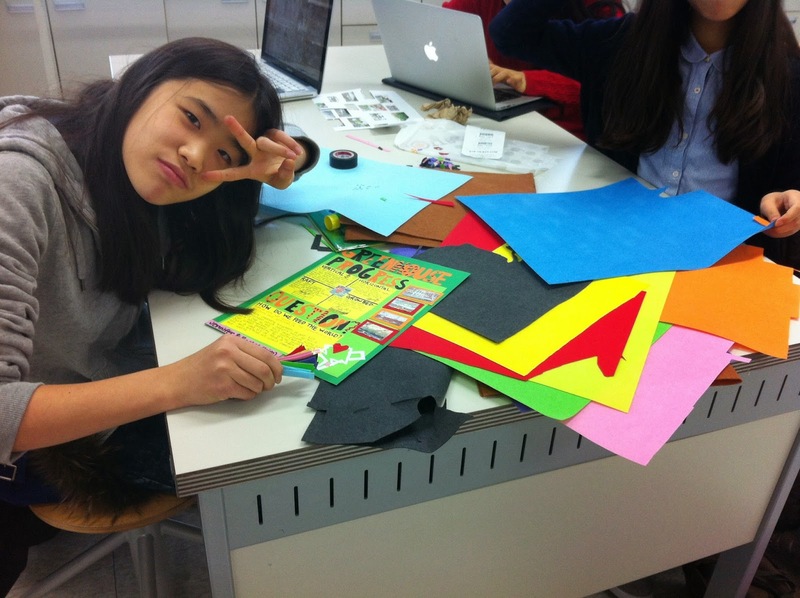 Jennifer and Rachel are making a poster, Nicholas and Michael are making a new system, Anna is working on making a new heater, Eugene, Daniel, and Sabine are also making a new system and Andrew is making a solar panel. Nicholas and Michael's new system. poster to spread the greenhouse. 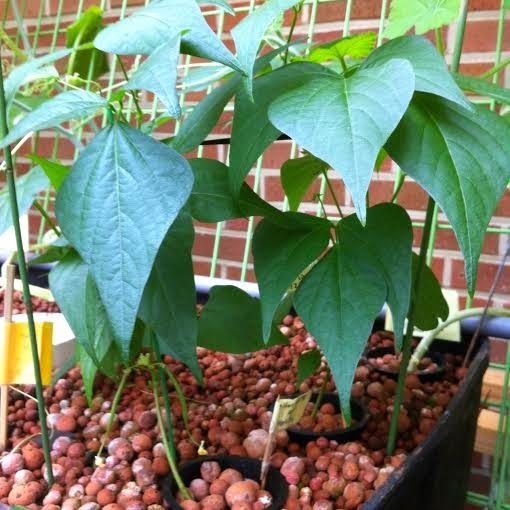 Farmer's Report- As I mentioned in my previous blog, some plants were growing slower than the other plants. 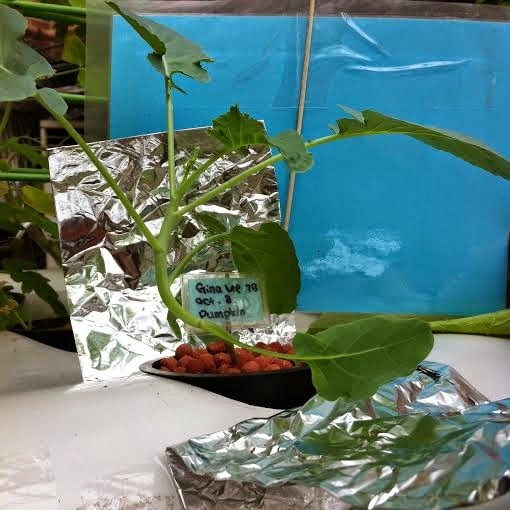 After we tried out the rectangular foils on some of the plants, it actually worked. That is why we decided to put these on multiple plants that were not growing fast enough and need more sunlight. 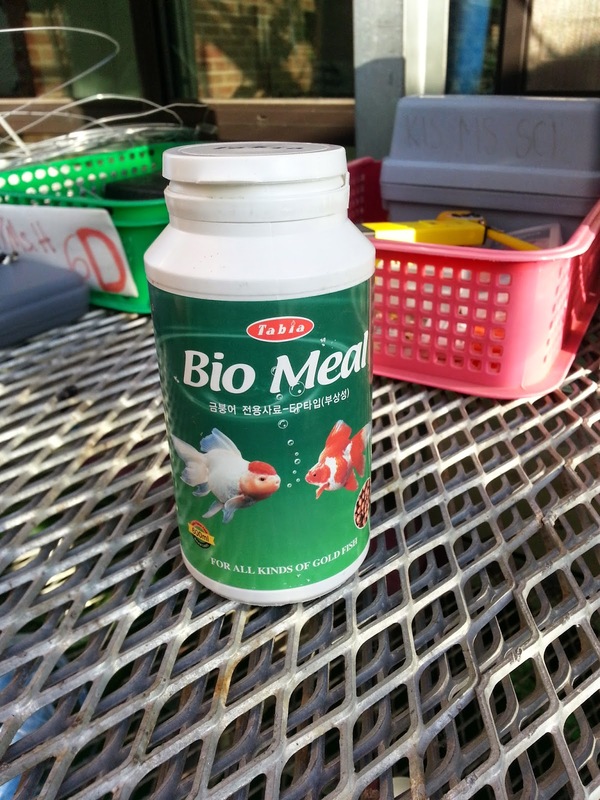 Today, the farmer accidentally put too much fish food in the tank for the fish. Unluckily, it was a problem. The fishes didn't eat all of the fish food so the fish food was ripped apart and it landed on the bottom of the tank. This would make the tank dirty. Another problem was the the fishes were so full. If this happens, some fishes might die, which we don't want. 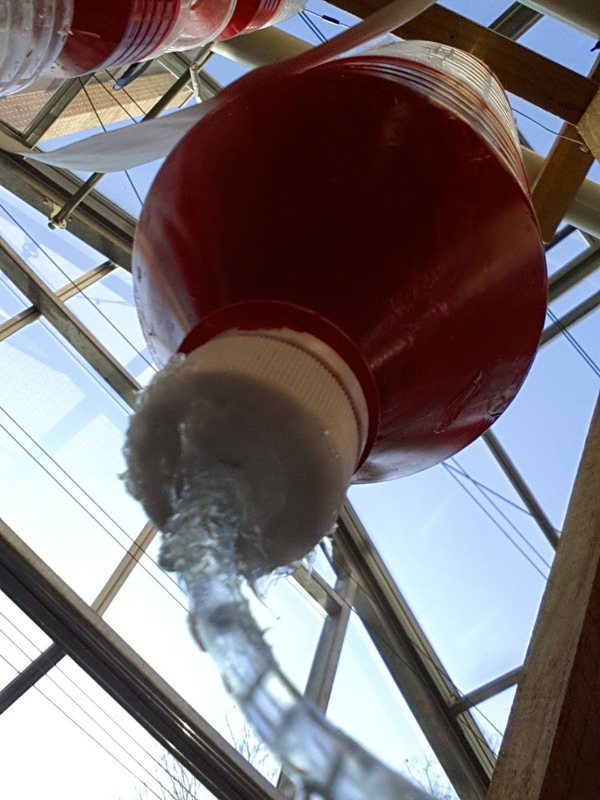 Engineer's Report- On the previous post, I said that there was a leak and we fixed it by putting hot glue gun on it. It did work for a short amount of time but it started to leak again after a short amount of time. The Engineer put even more glue gun on the leak and the leak stopped. Even if the leak stopped, it is really fragile and one touch can make the leak start again so we have to be really careful. 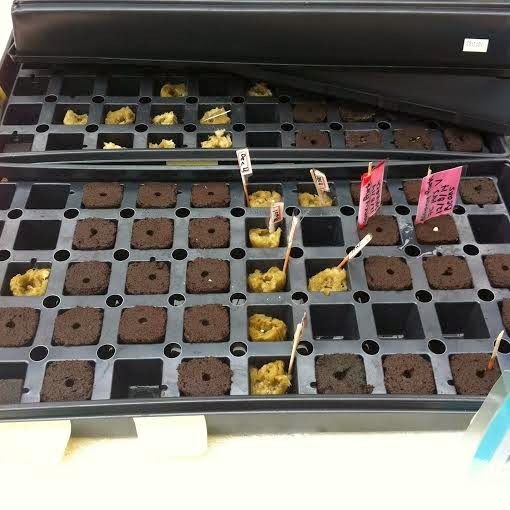 Research Biologist's Report- Today the Research Biologist decided to check which plants were growing the best in which system. 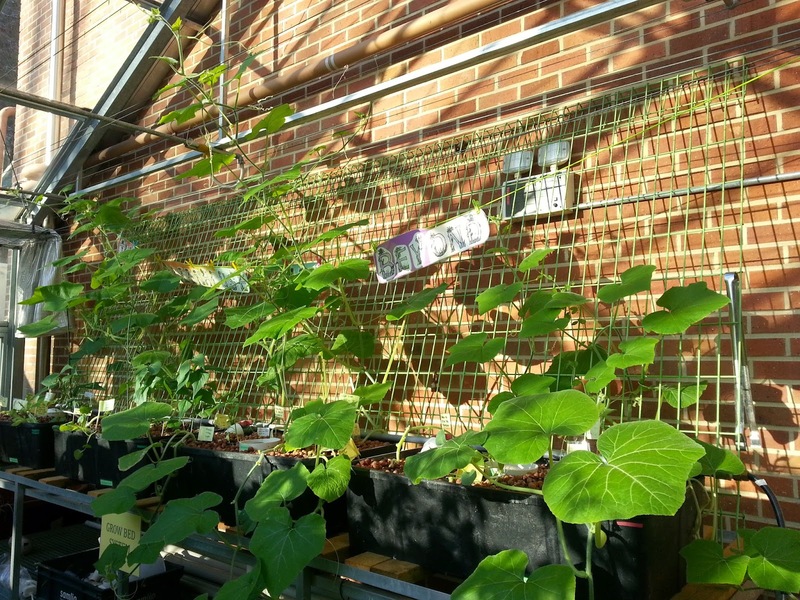 The pumpkins were dominating the Grow Bed System. 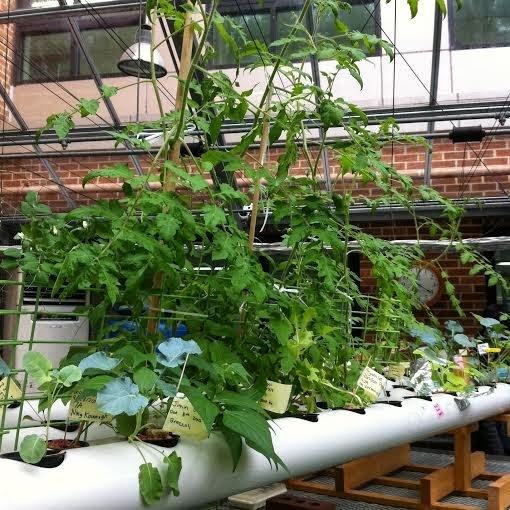 In the Horizontal System, there were multiple plants that were growing pretty well. 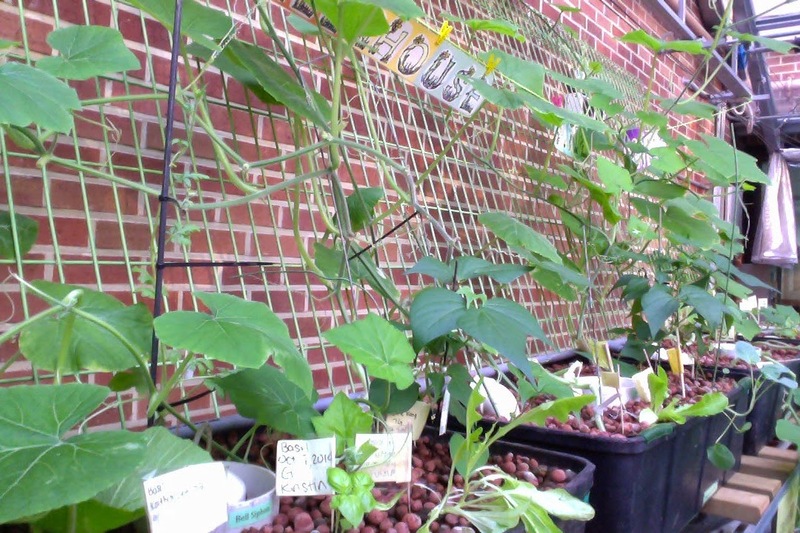 The super sioux tomatoes, beans, snow peas, and pumpkins were growing really good in the Horizontal System. In the Vertical system, there aren't any plants that are growing really well. We realized that the pumpkins were growing really well in the Grow Bed System because the pumpkin plant's roots are enormous. They need a lot of room to fit their roots in and the Grow Bed System had a lot of room for the roots. I feel that there aren't dominating plants in the Vertical System because the vertical System doesn't have enough room and it doesn't have the space to make plants sprout their roots. I also think that there were many leaks and other problems in the Vertical System that affected the plants. 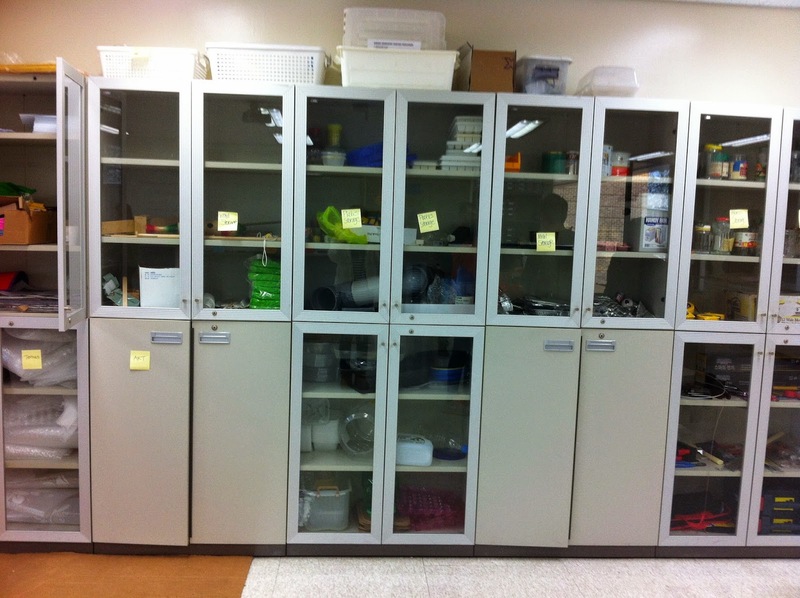 The boiler room is a place where we can build things and use as a storage for objects that can be reused. 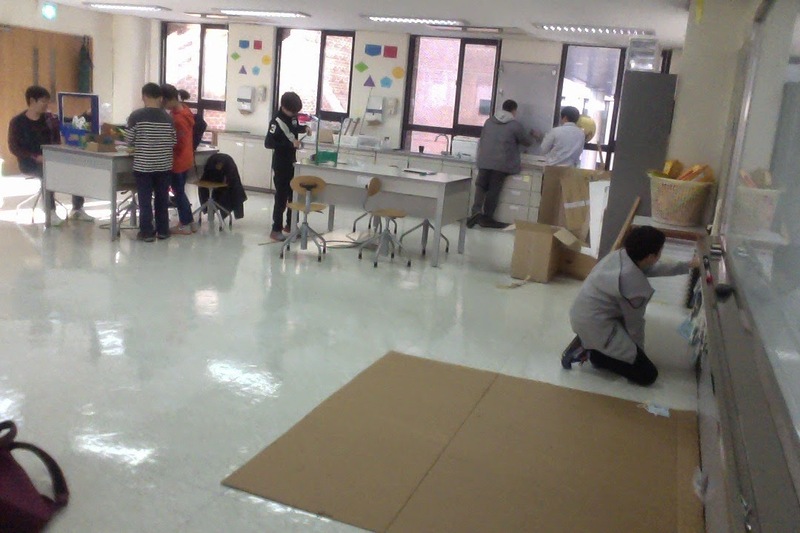 The boiler room is also reused because it used to be a science room but the teacher changed rooms so we has no use to this room, until the science teachers decided to make it a boiler room. 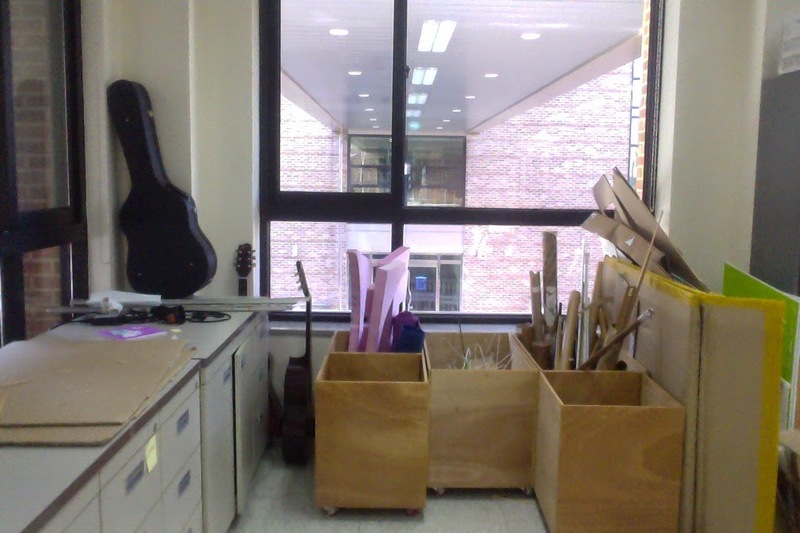 There are various objects and materials and we organise it in cabinets such as the cardboard, wood, glass, etc. In the boiler room, we also make various projects with different sixes and shapes. Since we're in the middle of doing a project, the boiler room is very useful for us. 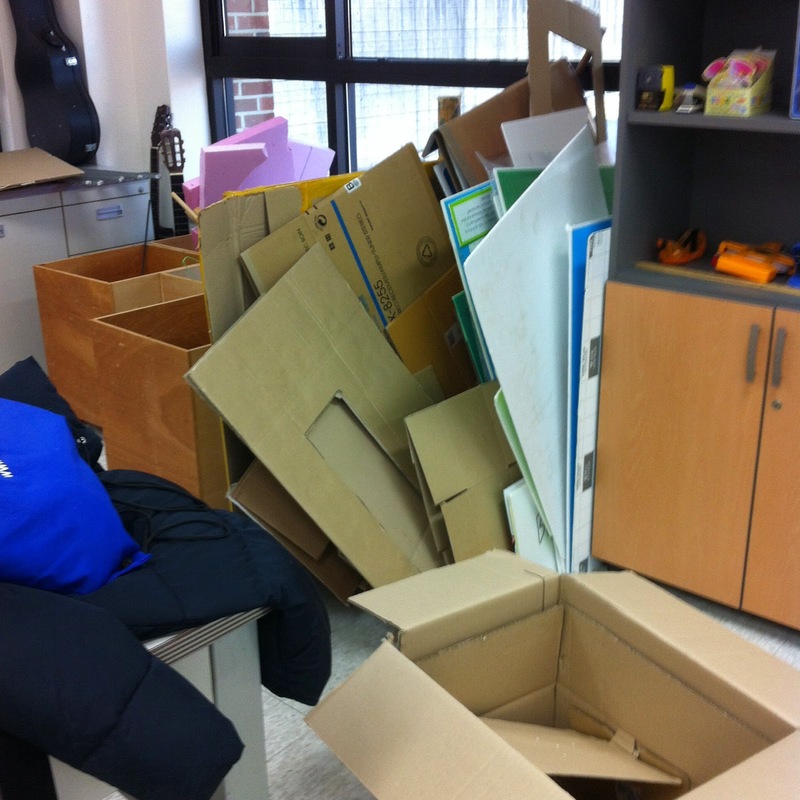 This room is also useful because we can be messy without making and the supplies are there for us. Another reason the boiler room is useful is because there is a cutting area with scissors and knives. The farmer realized that the plants didn't receive enough sunlight. 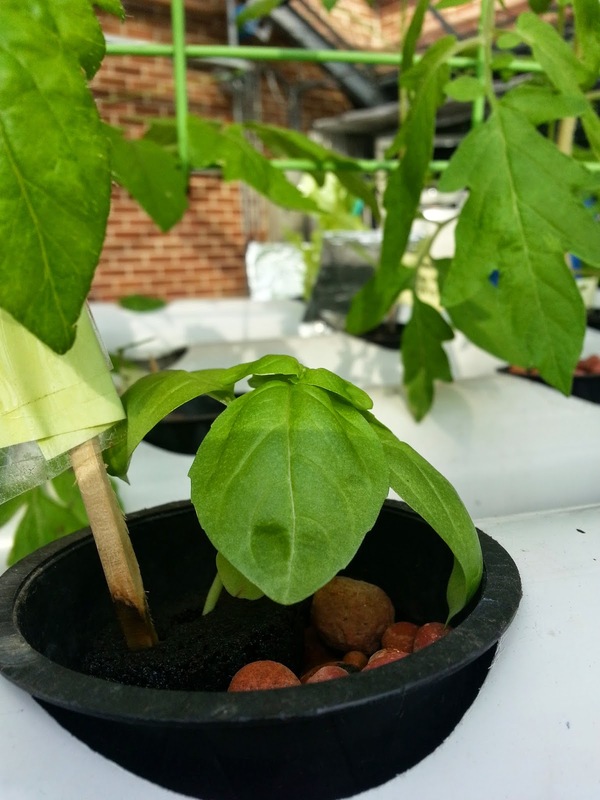 If a plant doesn't get the enough sunlight, they end up getting smaller than we expected them to be. 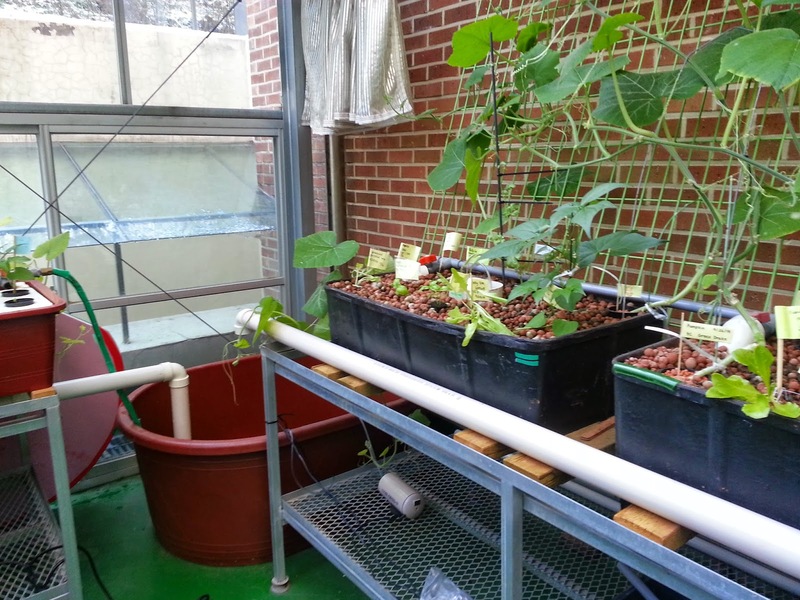 The problem was that the tall plants that has wide leaves were covering the sunlight that the smaller plants needed. As a result, the engineers found out a way to fix this problem. 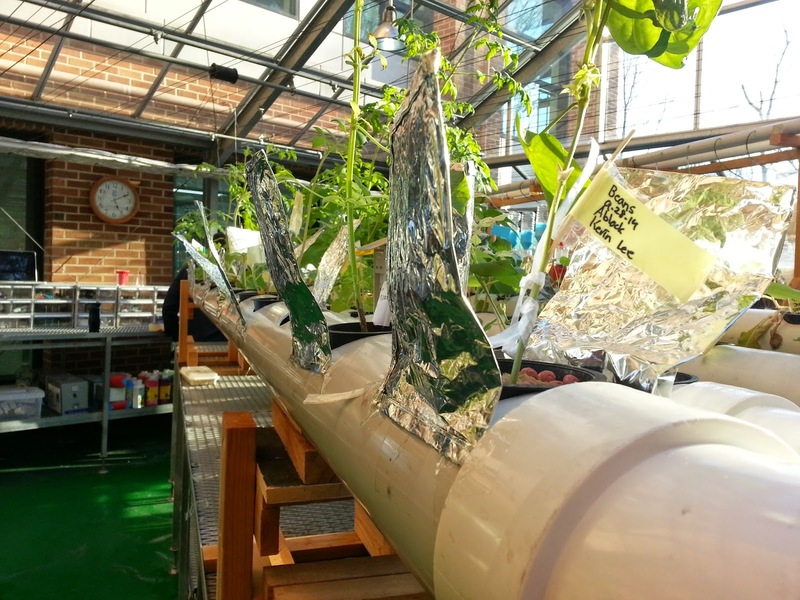 Engineer's Report- As we stated it in the farmer's report, some plants were not getting enough sunlight from, so we decided to use foil wrappers. We made 2 rectangles out of foil wrappers that are about 15 cm tall. Then, you put it on both sides of the plant. 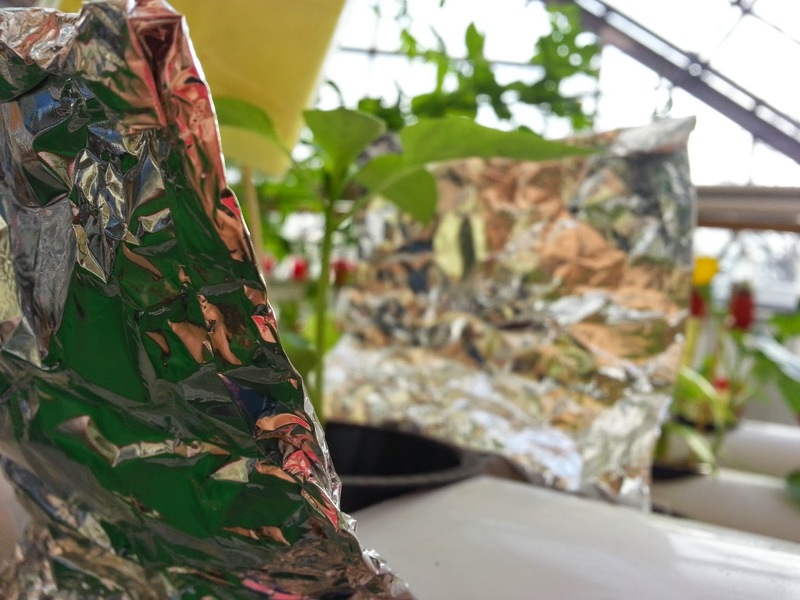 When the sunlight hits the tall foil, it would make a reflection towards the plant. 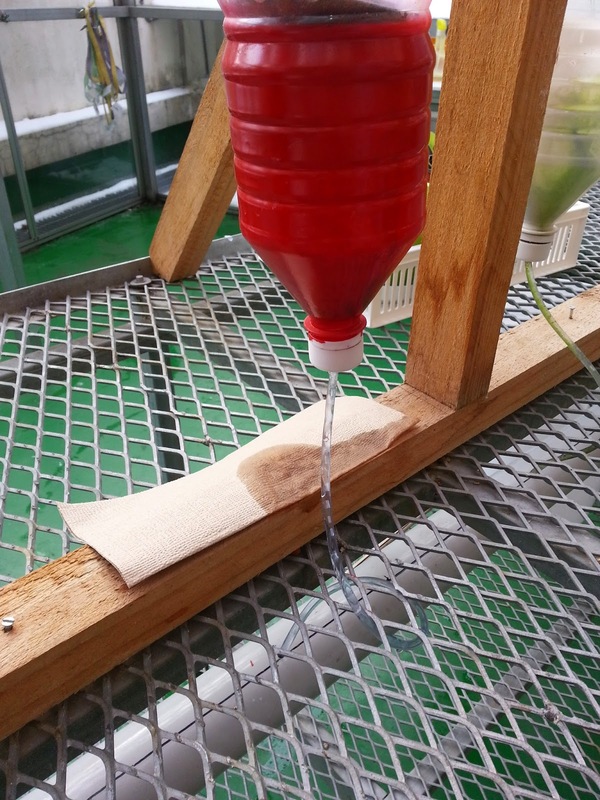 With this, the plant can obtain more sunlight from before. There was another problem in the Vertical System. On the bottom of the bottle there was another leak. 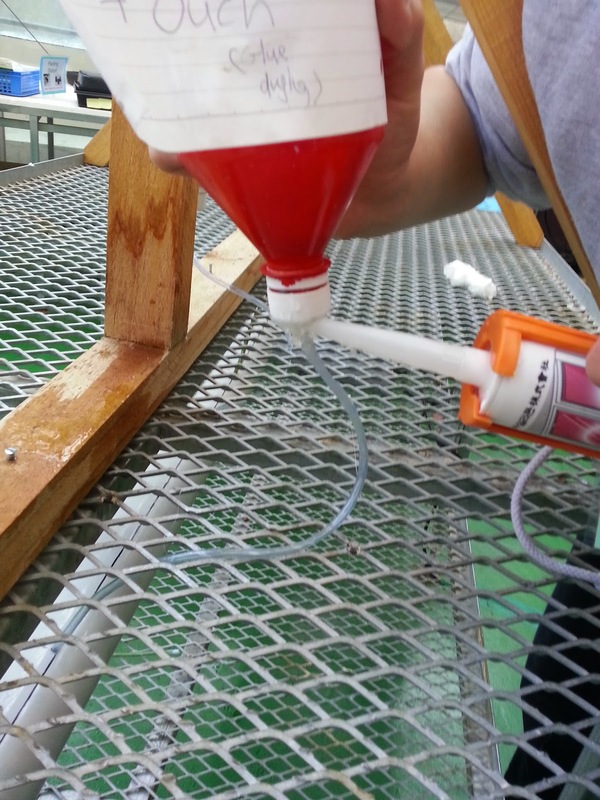 We realized that the hole on the cap was too large for the tube to cover, so there were drips of water coming out. First, we tried putting scotch tape around the tube and make the hole block up. Unfortunately, it didn't work out so well. This time we tried the electric tape and it still didn't work. 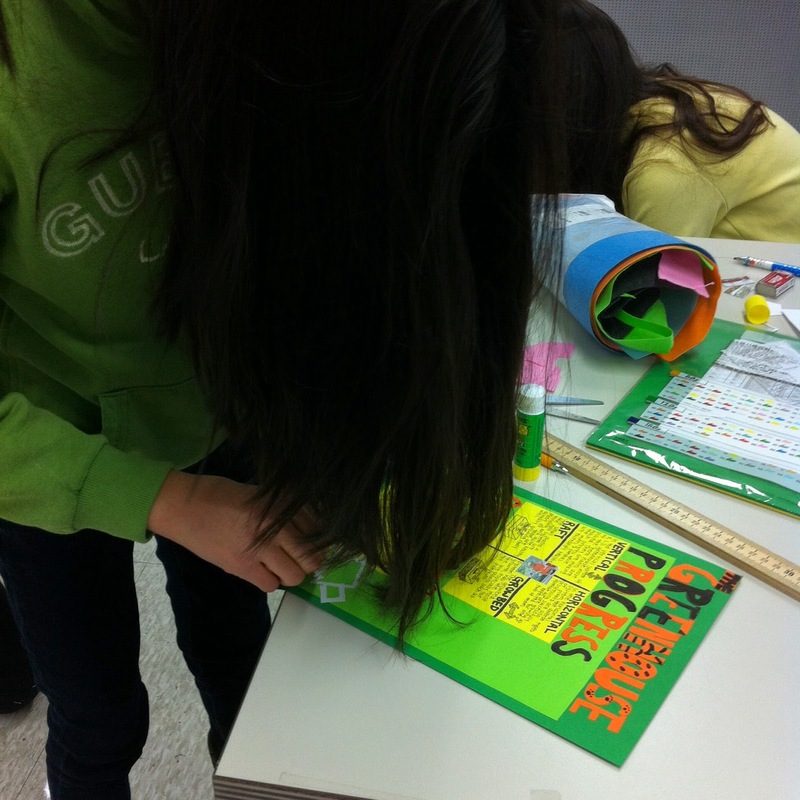 We finally found out the solution by using glue-gun and covering the hole. 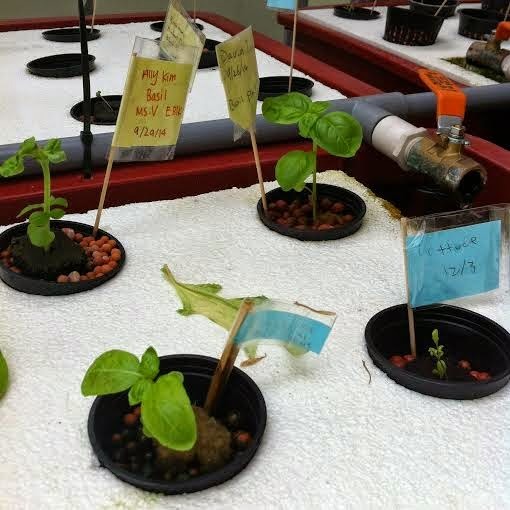 Research Biologist's Report- As we mentioned in the farmer's report, some plants didn't receive enough sunlight. The less the sunlight, the shorter the plant would be. Photosynthesis when the plant makes food from the sunlight, but if they don't get sunlight, it's same as not giving the plant it's food. If we leave the small plants alone, they are going to eventually die and we don't want that to happen. 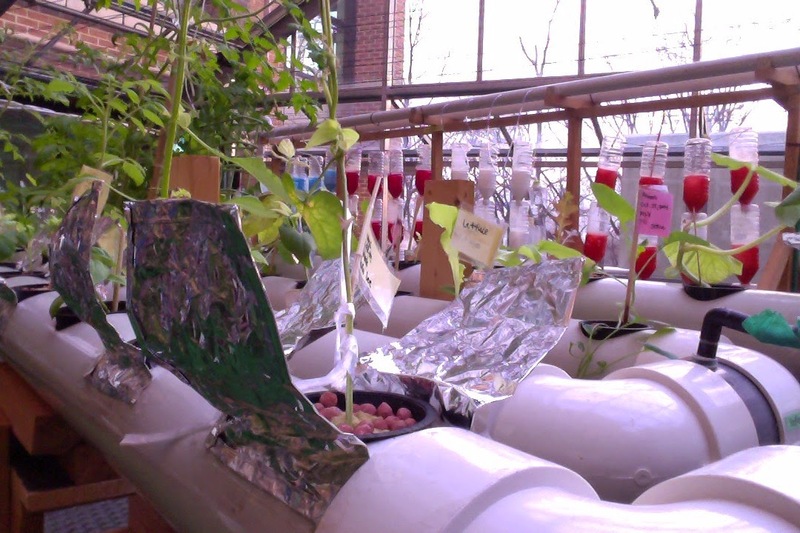 That is why we decided to make those rectangular foil to make the plants get enough sunlight and grow healthy.